Rightly or wrongly, the PN has placed itself in direct confrontation with the independent media. Its last remaining pen-holding sympathisers either work for it or work for the Labour Party with whom it shares many interests. When Saviour Balzan is your attorney, your days are numbered. When the Times of Malta rolls out an editorial with a headline that starkly places you across a ditch and pitches for battle against you, you know – or you should know – it’s game over. This is not to suggest the independent media can do no wrong. Nor that Times of Malta does not have days of weakness in its past. Nobody and nothing is perfect. Nobody and nothing is without error, bias, influence and pressure. All independent media faces apparently insurmountable odds. The charge by the political class that the media is not to be trusted, that it is the purveyor of ‘fake news’, that it is made of witches and traitors, that it serves the interests of the ‘other’ party when it criticises either one, is effective. The pressure on independent media conventionally came from the Labour Party because it is the veteran of irrational, counter-intuitive, illogical, obscurantist politics. But now the PN finds itself – or rather, has placed itself — in a Trumpian confrontation with the independent press aligning itself with Joseph Muscat’s politics against the logical aspirations of free speech, the rule of law and a consistent commitment to demand politics are conducted without corruption. The PN has adopted a short and sharp dagger style in its back-to-the-wall panic of the last several months. The Sunday morning front-pages of its Il-Mument have graduated from partisan attacks on their Labour rivals – predictable, perhaps boring, but certainly fitting in some form of legitimate brief – to a weapon of intimidation against those daring to step out of the line the PN seems to perceive people should keep to. They have accused activists campaigning for justice for an assassinated journalist, of conspiring to kill babies. They have collaborated with a government crackdown on activists, charging them with profiteering. Yesterday they lashed at Times of Malta by all accounts because of the hugely damaging story about Herman Schiavone and Kristy Debono’s meetings with Yorgen Fenech. Today’s Times of Malta editorial was a 600 word manner of saying ‘of course you realise, Sir, that this means war’. My views about the merits of the Yorgen Fenech debacle are of course clear from what I’ve already written on this blog. Knowing about the Portomaso meeting was in the public interest and that’s not because it makes Adrian Delia’s position in the PN ever more precarious. It’s because the incident has demonstrated something involving pathological ignorance of the issues, a childish vulnerability to manipulation by people in wealth or power, an amateurish approach to crisis management, an incoherence in political messaging, a paralysing financial exposure, a leadership crew that is flattered if described as miles below par and a callous insensitivity to what people might feel about the PN continuing a cosy relationship with people who were at least enormously invested in the silencing of Daphne Caruana Galizia. But leave aside my views or even the merits of the incident that provoked the PN’s onslaught on the Times of Malta. Assume even for the sake of argument that Times of Malta had been unfair this time. Evaluate then how the PN managed the situation allowing for the fact that in its own mind it was in the right. The only possible assessment is that it has managed the situation disastrously and in jeopardy of its own raw interests. Everyone makes major press relations errors: all governments, all parties, all loci of power at some point comes to regret the way they handled the press. But governments, parties and loci of power that still have a sense of their own survival understand that the newspaper will still be there tomorrow. 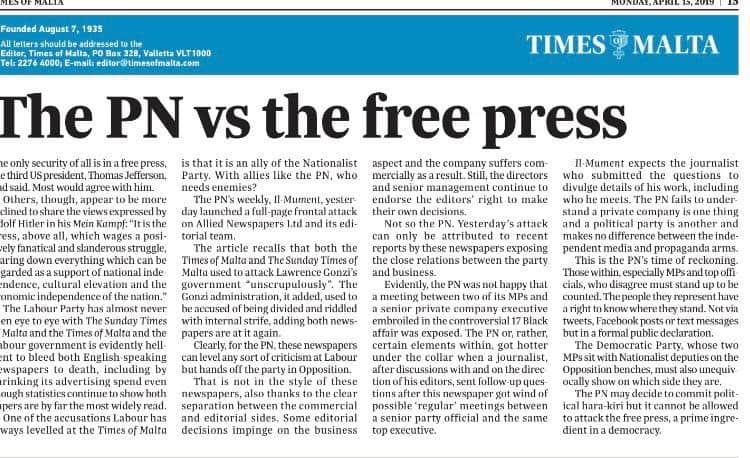 Even if the PN has lost any sense of respect it may have had for independent journalists, it should still have enough self-respect to know that starting inter-generational feuds with the Times of Malta is a leaden seal on its own coffin. Political parties have, perhaps rightly, understood that the conventional deference for the influence of the press is less necessary today than it was in the past. They have their own media and in any case social media allows them to short-circuit the filtering of the press. Journalists are no longer gate-keepers of information, true. But in a democratic context political parties that exploit that fact and push aside the press and avoid engaging with critical journalists (or worse launch campaigns to discredit them, bankrupt them or eliminate them) are making the conscious choice of quitting the democratic space and march, instead, into autocracy. Just because they can rule by decree, does not mean they should. The PN is showing clear symptoms of the atrophying of that part of its brain that needed to think through its statements and behaviour to make sure they are approved of by the independent media. Perhaps irrevocably. Not needing to look good in the eyes of Times of Malta gives it a dangerous arrogance and an undemocratic indifference to minority views, even to rational thinking. There’s a misguided notion in democratic life (including ironically in the judgements the independent press makes about what opinions to cover and report on) that only numbers matter. That a thought through and rational opinion, if held by few people, has less merit than the hysterical knee jerk reaction of an angry crowd. That is the definition of mob rule. It is the death of democracy. It is a white terror. The Nationalist Party might fancy its chances of winning a war labelled “The PN vs the free press” though it would take an inebriated god in some long lost pantheon to figure out why it might feel that way. But in choosing to fight that war, the PN shows it has decided to follow Joseph Muscat’s Labour and abandon the democratic field of battle.